Wheels Up, Surf Air and newcomers Waves are all making use of proprietary apps, a significant shift for business aviation, which until recently has thrived on personal relationships with customers. This is where Magliocchetti’s expertise lies - his background is in applying technology to “distressed assets” to turn them around before selling them on. His plan going forward is to license the WAVES platform on a technological level and sell It to other inter-island or air taxi operators globally. However, to give customers the confidence to buy these kinds of services online, its important Wheels Up owns its own aircraft. (The operations are managed by Gama Aviation in the US, who do a great job, he said.) Colucci argued a “closed fleet” offered customers the “safety, security, stability and surety” and allowed his company to take advantage of the fact people no longer wanted to own their own business jets in the face of rapidly depreciating values. Talling-Smith confirmed Surf Air has already been approached by other geographies wanting to roll out a similar model, but making it work across the staggering land mass of South East Asia was something that needed thinking about. For Surf Air and Wheels Up, which are both based on subscription models, the benefit is predictable revenue for investors. For Surf Air, operating on a schedule means predicable costs too. Although Wheels Up only has limited shuttle services - between New York and Martha’s Vineyard during the summer, for example - Colucci added that the membership business has better margins that the aviation business. Talling-Smith pointed out that subscription models are doing well across all markets, be it for private jets or for razor blades. He claimed the most important thing for sustainably is loyalty: “Churn is the death of subscription models.” An interesting point, since loyalty to commercial airlines is fast disappearing. Nonetheless, both recognise there’s a more negative perception of business aviation in Europe, where they’re trying to expand. Waves may not be faced with the same perception problem, as its market in the Channel Islands has a niche set of circumstances. Magliocchetti stated that over the last decade, air passenger numbers on both inter-island services and island to Mainland UK flights have decreased by 50% from 250,000 per year to 112,000 due to poor customer experience on commercial airlines. Magliocchetti revealed that while airlines charge between £40 and £130 each way using the dynamic pricing model, Waves (which isn’t a members-only service) has a fixed price of £65 each way. When faced with the question about how its Cessna Caravans deal with the unpredictable weather in the Channel Islands, Magliocchetti says while commercial passengers will sit in the airport or the tarmac waiting for it to clear, Waves can communicate with its customers, telling them to stay at home a little longer or offering them the choice to re- book. 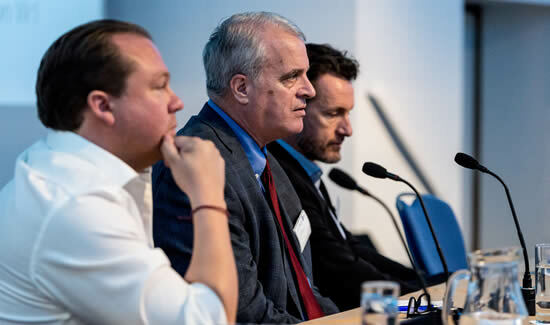 With veteran journalist and moderator Kathryn Creedy saying there are no less than 14 studies concluding business aviation is good for the bottom line of businesses, it seems these three might be onto something!